TOURISTS FLOCK TO NASHVILLE FOR GRAND OLE OPRY SHOWS that have defined the city as the capital of country music since 1925. Downtown, in the Tennessee statehouse, a different spectacle has provoked considerable attention—a red-hot battle over immigration. Visitors can see why immigration is sparking bitter controversy in a state that’s a long way from any U.S. border by driving down Nolensville Pike past the airport. Signs in Spanish abound. Hispanic day laborers gather outside a Spanish grocery store. Checks cashed, loans, legal services—immigrants can find whatever they need here without having to navigate the English-speaking world. Many residents of Tennessee are not accustomed to reading signs in Spanish and don’t like the trend. The number of Hispanic immigrants statewide swelled from about 33,000 in 1990 to nearly 124,000 in 2000, an increase of 278 percent. Music City ranks first among U.S. cities in immigration growth since 1990. Nashville provides a case study in the country’s broken immigration system. Commuters get regular doses of anti-immigrant sentiment on the radio. Legislative measures targeting undocumented immigrants pop up faster than country-western singers on stage. The city nearly adopted an English-only standard for official business. The county sheriff’s office has launched an effort to identify undocumented immigrants among arrestees and refer them for deportation proceedings. Here, as elsewhere, undocumented immigrants provide cheap labor, but public attitudes are deeply split on whether to deport them or set them on a path toward citizenship. Their advocates face an uphill battle, as David Lubell ’98 knows well. He is the executive director of the Tennessee Immigrant and Refugee Rights Coalition (TIRRC), a group that has labored to organize the new immigrant communities, defeat anti-immigrant proposals, and to portray immigrants—documented or not—in a positive way. At first glance Lubell seems to be an unlikely candidate for leading an immigrant coalition in America’s Red State heartland. He is no rabble-rouser and appeals to the crowd more with facts than fury. Tall and with a gangly stride, he looks young enough to pass as a graduate student. But there is no mistaking his commitment to the cause of immigrant rights. Lubell acknowledges that a legitimate point lies behind harsh sentiments arising in the ongoing immigration debate: the U.S. immigration system urgently needs a major overhaul. The ongoing influx of undocumented workers into the country is damaging for all concerned. Lubell favors measures that would enable much-needed workers to enter the country legally, and he would help those who are already here become citizens. He is a strong advocate of keeping families together and expresses concern that a guest worker program might create a permanent underclass in the United States. Last November Lubell’s work style was on display at an annual meeting of immigrant rights groups seeking to develop priorities and strategies for the upcoming year. In the cafeteria of suburban Nashville’s Glencliff High School, spruced up modestly with balloons and tablecloths, Lubell floated through the crowd with handshakes, hugs, and earnest conversation. Enthusiasm and high spirits dominated the day in the multi-ethnic gathering, but Lubell was well aware of the hardships that lay ahead. Coalition building is not easy in Tennessee, especially if you are a white, Jewish, Yankee, liberal, carpetbagger,” says Lubell tongue-in-cheek. He came to Wesleyan from Germantown Friends School in Philadelphia and soon after began working with students throughout Connecticut to oppose an effort by then-governor John Rowland to eliminate a rental assistance program. He worked directly with Latinos and with Professor of Sociology Robert Rosenthal, a longtime advocate of merging academics with community service. “It was really clear from the first time I met him that he was going to be invested in social justice work,” Rosenthal says. To organize successfully, he observes, you need persistence and an optimistic view of the world that doesn’t crumble when you are outspent and outpowered by those who don’t want change. You need a sense of outrage that doesn’t succumb to bitterness. Rosenthal cites Lubell as “clear-eyed and hard working,” someone who quickly became central to the Connecticut State Coalition for Housing Justice. After spending a year teaching English in Ecuador, romance brought Lubell to Memphis. He soon became caught up in health issues for immigrants while working at a nonprofit, Latino Memphis. Shortly thereafter, the Tennessee legislature waded into an issue that brought immigration to the forefront of political debate. In the spring of 2001, a Democratically controlled legislature passed legislation, signed by a Republican governor, that granted undocumented immigrants the right to obtain a driver’s license. Lubell had helped lead the ad-hoc coalition of immigrant organizations and allies who had advocated for the legislation. The argument for it was that everyone driving should know the rules of the road and have access to insurance. The bill appeared to be a major advance for immigrants, particularly since only Utah had adopted a similar measure. The act produced long lines of people waiting to obtain drivers licenses, and almost immediately some members of the Tennessee legislature began to regret its passage. Regret grew to loud clamoring after the attacks of 9/11 when opponents argued that the bill threatened homeland security by giving a widely recognized form of identification to people in the country without proper documentation. The bill quickly became a focus of attention for a growing backlash against undocumented immigrants. Lubell, aware that the groundbreaking driver’s license legislation would be defeated without a major fight, started formalizing the coalition of pro-immigrant groups. With $9,000 to start a new venture, he left Latino Memphis and founded the Tennessee Immigrant and Refugee Rights Coalition. The fate of the driver’s license law underscores that difficulty. In 2004, the Tennessee legislature rolled back the law so that undocumented immigrants were eligible only for a driving certificate. It could not be used for identification: cashing a check, boarding a plane, or buying a beer. In the legislative session that concluded in June, the license law was fully repealed, leaving undocumented immigrants without a legal means to drive. Battles over immigrants extend from the statehouse to towns and cities across Tennessee. Lubell’s organization vigorously opposed a proposal before the Nashville city council to require that English, and only English, be used in all official transactions, spoken or written. The proposal was somewhat surprising since Nashville has a cosmopolitan and mildly progressive reputation among Southern cities. The city has a large tourism industry and is highly conscious of its image. Vanderbilt University adds luster to a downtown that rollicks with country music. Other communities are emulating Nashville. Cherokee County, a fast-growing suburb of Atlanta, adopted an English-only ordinance in December, as have small towns such as Taneytown, Maryland, and Pahrump, Nevada. In Nashville, the measure’s sponsor said it was intended to offer immigrants an incentive to learn English. “This bill passed because enough council members believed, with surprising confirmation by the sponsor, that the bill will have no effect at all,” Lubell told supporters. The city’s legal counsel, however, raised concerns over its constitutionality, particularly around First Amendment issues. Lubell and his TIRCC colleagues don’t confine their efforts to fighting anti-immigrant proposals. They helped mobilize thousands of people in the state for a march last year in support of immigration reform. They lobbied successfully for an increase in English language classes. They backed a billboard campaign, “Welcoming Tennessee,” to influence public perceptions about immigrants. On the airwaves, Nashville residents hear the virulently anti-immigrant voice of Phil Valentine, whose show on 99.7–FM catches afternoon rush hour listeners. Valentine’s show tops Rush Limbaugh and Bill O’Reilly as the most-listened-to issue oriented talk show in Nashville, and thanks to a syndication agreement with Westwood One, he is being heard in other markets as well. He likes to advertise his self-confessed political incorrectness by saying, “Wake up and smell the tacos.” He has launched a campaign to “demagnetize” America—that is, make it less attractive to immigrants. Although Valentine’s campaign seems calculated more for its public relations value than for any realistic chance of success, Tennessee is witnessing a rapid growth in efforts to impose new restrictions on undocumented workers. Bills introduced at the state level, for example, would have denied all public services to undocumented workers, including health services, and prohibited translation of the driver’s license exam into languages other than English. In the just-concluded legislative session, legislators introduced 44 anti-immigrant proposals. Thanks in part to the efforts of TIRRC and its supporters, only two passed: repeal of the driver’s license program and a bill that authorizes the state highway patrol to enter into an agreement with the Department of Homeland Security to enforce immigration statutes. Tennessee has seen an effort to prevent a local librarian from supplying books in Spanish, a Springfield county alderman who wanted to keep Spanish speakers out of public parks, and a judge who told a Mexican woman that she had six months to learn English or lose custody of her children. Lubell and his colleagues do what they can to publicize these and other incidents. “Every day we talk to people who are afraid to leave their families in the morning because they might not come back. We’ve seen cases where they don’t,” Lubell says. Claudia Nunez is one of the cases. She and her attorney came to the TIRRC conference at Glencliff High School in an attempt to garner support. Originally from El Salvador, she entered this country legally but did not leave when her tourist visa expired. She now has a husband who is in the country legally and two children who are U.S. citizens. When she went to pay a motor vehicle fine, she was arrested and is now facing deportation. Her case illustrates the problem with the current immigration system: it leads to highly unsatisfactory choices. The rage against undocumented immigrants, the legislative proposals aimed at them, and the tales of individual tragedies will most likely continue as long as no comprehensive federal solution exists. Lubell has taken some long van rides with supporters to Washington to advocate for legislation that has been proposed. Promoting immigration reform is the top objective of TIRRC this year in spite of the failure of Congress to produce legislation. 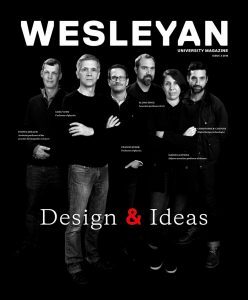 William Holder ¹75 is editor of Wesleyan magazine.